The Sufi is an Israelite, especially in his study and mastery of the different names of God. The miraculous powers of Moses can also be found in the lives of the Sufis both past and present. In fact the Sufi is the master of the Hebrew mysticism; the divine voice heard by Moses on Mount Sinai in the past is audible to many a Sufi today. THE INAYATI-MAIMUNI TARIQAT is an inter-spiritual fellowship of seekers committed to a rigorous path of spiritual development based upon both Sufi and Hasidic principles and practices. In this tariqat or "order," the Sufi lineage of Hazrat Inayat Khan (1882-1927), the first Sufi master to bring Sufism into the West, has been joined to the Hasidic lineage of Rabbi Israel ben Eliezer, the Ba'al Shem Tov (1698-1760), founder of the influential 18th Century Hasidic movement. It is not the first time that these two mystical paths associated with Islam and Judaism have been brought together; in true spirit the original Egyptian Sufi-Hasidism was practiced by Rabbi Avraham Maimuni of Fustat (1186-1237), who successfully combined these paths as far back as the 13th Century. For this reason, the "Inayati-Maimuniyya," is called honoring both Inayat Khan's vision of Sufism as a universal approach to spirituality, and Avraham Maimuni's radical innovation which made a peaceful marriage between Jewish Hasidism and Islamic Sufism in a time of open conflict between the Abrahamic traditions. THE INAYATI-MAIMUNI LINEAGE takes its name from Rabbi Avraham Maimuni of Fustat (1186-1237), the son of the great philosopher and Jewish codifier, Rabbi Moshe ben Maimun, popularly called, Maimonides. In his time, Avraham Maimuni was one of the most celebrated and influential Jewish leaders in the Mid-East. As the court physician to Sultan Al-Kamil of Egypt (1180-1238) and Nagid ("prince" or leader) of all Egyptian Jewry, he was in a position of unique influence. But still more significant to the history of religion was his open acceptance and embrace of Sufi concepts and practices. Of course, the use of such concepts could already be found in the Jewish writings of Bahya ibn Pakuda (ca. 1040), but Avraham Maimuni openly acknowledges his debt to Sufism, even going so far as to call the Sufis the true lineal descendants of the Hebrew prophets. 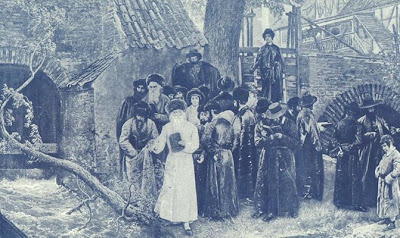 Moreover, there are evidence in various documents of a vital community of Sufi-Hasidim under his leadership, practicing Judaism in a manner clearly influenced by Sufi communal practices. This Sufi-Hasidic community seems to have continued under the leadership of his children and grandchildren for up to four more generations in Egypt. The Desert Fellowship of the Message | Just as the message of Hazrat Inayat Khan recognizes the essential unity underlying all spiritual paths, seeing Sufism as a perennial approach to these paths, so also is seen by Hasidism. Thus, the Inayati-Maimuni Tariqat, while certainly connected to the religious traditions of Islam and Judaism, is not limited to them, emphasizing instead the perennial Sufi and Hasidic teachings and methods that evolved out of these traditions. This is why sufi hasidim has also chosen to identify more broadly as The Desert Fellowship of the Message. For the Message is of the essential unity of all Being (as taught by Hazrat Inayat Khan), and the Desert has always been symbolic of where the Message is to be found, especially as the Hasidim, Ihidaya, and Sufiyya - the mystical fellowships of Judaism, Christianity, and Islam - all have their origins in the desert. Indeed, nearly all the mystical traditions of the world have foundations in the "desert experience" of the place of solitude, the wilderness where all boundaries cease to exist. Thus, we return to the desert again and again to hear that Message for ourselves, renewing it in our hearts year after year.